An Indian satellite built as a technological testbed for mobile communications successfully launched Thursday on top of a Geosynchronous Satellite Launch Vehicle, one of 10 space missions planned by India by the end of the year. The GSAT 6A spacecraft, carrying a deployable S-band antenna and multiple communications beams, lifted off on top of India’s Geosynchronous Satellite Launch Vehicle at 1126 GMT (7:26 a.m. EDT; 4:56 p.m. Indian time). The 161-foot-tall (49-meter) GSLV Mk.2 rocket took off with nearly 1.8 million pounds of thrust from the Satish Dhawan Space Center, a coastal spaceport located on Sriharikota Island around 50 miles (80 kilometers) north of Chennai on the country’s east coast. Four liquid-fueled Vikas engines ignited in the final seconds of the countdown, and a core rocket motor consuming pre-packed solid propellant ignited to boost the GSLV Mk.2 into a clear late afternoon sky. 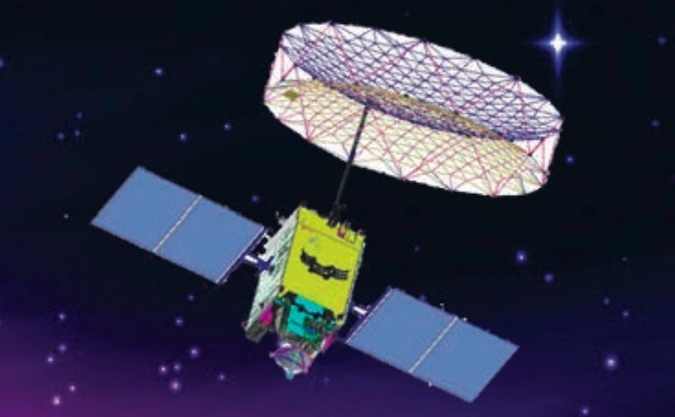 The rocket’s guidance computer commanded the GSLV Mk.2 on a course east-southeast from the Sriharikota space base. The launcher’s core stage emptied its solid propellant casing and burned out less than two minutes after liftoff, and the four Vikas booster engines shut down around two-and-a-half minutes into the flight. 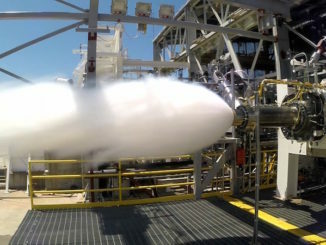 A Vikas engine on the GSLV Mk.2’s second stage ramped up to full power, generating around 190,000 pounds of thrust during a 2-minute, 12-second firing. That’s a 6 percent increase in thrust over Vikas engines flown on earlier GSLV missions. Indian engineers wanted to demonstrate the High Thrust Vikas Engine’s performance Thursday before introducing the upgrade to the four Vikas engines that power the GSLV Mk.2’s strap-on boosters on future missions. The second stage also employed electromechanical actuators powered by lithium-ion batteries for the first time, replacing hydraulic systems used on past missions. The technology change will make the rocket more reliable, Indian officials said. The rocket’s metallic 11.1-foot (3.4-meter) nose cone dropped away in a clamshell-like fashion at T+plus 3 minutes, 45 seconds, during the second stage burn. 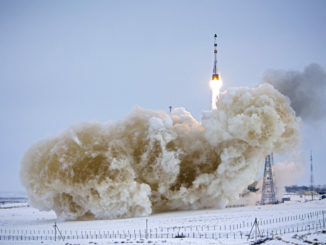 Ignition of the third stage’s hydrogen-fueled engine occurred at approximately T+plus 4 minutes, 46 minutes, for a firing that lasted nearly 13 minutes. In another first, the upper stage was programmed to fire a few seconds longer than on past missions to deplete the engine’s liquid oxygen supply, giving the GSAT 6A satellite an extra bit of energy toward its high-altitude orbit. Live video from an on-board camera showed the GSAT 6A satellite separating from the GSLV Mk.2’s third stage around 18 minutes after liftoff. A round of applause inside the launch control center heralded the successful mission. “Today, the fifth successive successful launch of GSLV with an indigenous cryogenic stage successfully placed the high-power S-band communications satellite GSAT 6A in the designated orbit precisely,” said K. Sivan, chairman of the Indian Space Research Organization. A rocket propulsion expert who took over ISRO’s top post in January, Sivan said the GSLV Mk.2’s performance enhancements are aimed at eventually increasing the rocket’s lift capability to near 3 metric tons — about 6,600 pounds. The higher-thrust Vikas engines will be installed on the first stage boosters flown on future GSLV Mk.2 missions. The GSAT 6A satellite launched Thursday is similar in design to the GSAT 6 telecom craft successfully launched by a GSLV Mk.2 rocket in 2015. 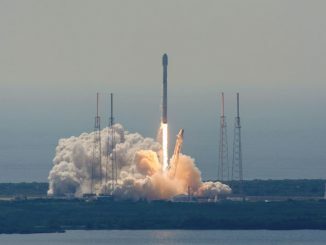 “GSAT 6A is a complement to GSAT 6, which is already in orbit,” Sivan said. “These two satellites combined are going to provide a platform for development of advanced technologies, such as unfurlable antennas, hand-held devices and ground networks for two-way point-to-point satellite communications,” Sivan said. The GSLV Mk.2’s third stage released the GSAT 6A satellite into an elliptical transfer orbit stretching from a low altitude of around 92 miles (149 kilometers) to a peak altitude around 22,685 miles (36,508 kilometers), according to U.S. military tracking data. The orbit was tilted at an angle of 20.7 degrees to the equator. The altitude and inclination parameters were close to pre-flight predictions. Using three major orbit-raising maneuvers, GSAT 6A’s on-board engine will circularize its orbit over the equator over the next week, parking at an altitude where the satellite’s velocity will match the rate of Earth’s rotation. Geostationary orbits are typically used by communications satellites, and GSAT 6A will operate from a position at 83 degrees east longitude, giving the craft’s five S-band spot beams and single C-band beam coverage over India. GSAT 6A will unfurl a 20-foot (6-meter) S-band antenna once it arrives in geostationary orbit. The new satellite is the second Indian spacecraft to feature such a large antenna. 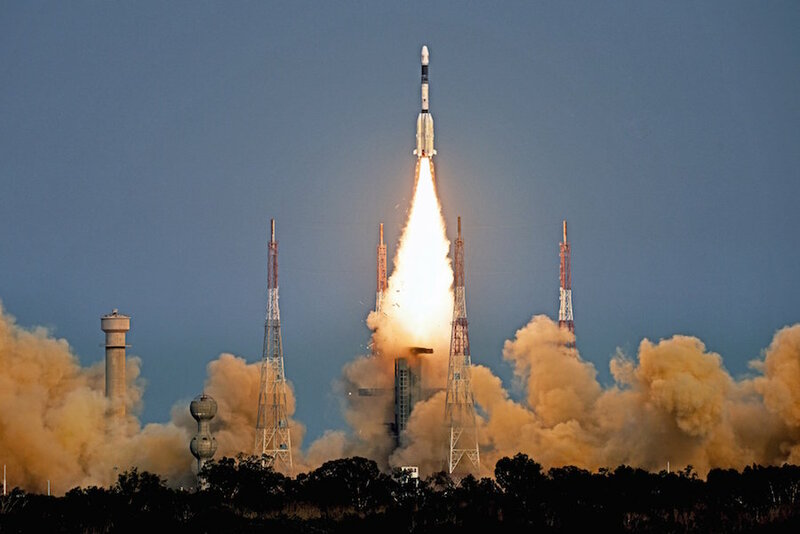 The Indian military will be a prime user of GSAT 6A, using the satellite’s ability to connect with small terminals on ships and in other mobile vehicles. V. Ramanathan, ISRO’s satellite director for the GSAT 6A satellite, said in remarks after the launch that the new spacecraft deployed its electricity-generating solar panels shortly after separation from the rocket’s third stage. Thursday’s launch was the 12th flight of India’s GSLV Mk.1 and Mk.2 rocket family since 2001, and the sixth to use an Indian-built cryogenic third stage engine. Six previous missions flown in the GSLV Mk.1 configuration launched with a Russian-manufactured upper stage engine before Indian engineers completed development of a domestic cryogenic engine. With Thursday’s launch, the GSLV Mk.2 has logged five successful missions in a row after the four previous GSLV flights — including both Mk.1 and Mk.2 versions — suffered total or partial failures. “What is next? Definitely, ISRO has huge plans,” Sivan said after Thursday’s launch. “This year is going to be another high-profile year for ISRO. India’s next space mission is set for launch April 12, when a Polar Satellite Launch Vehicle will loft the country’s ninth navigation satellite from a different launch pad at Sriharikota. If workers at the spaceport keep the PSLV mission on track, it will mark the shortest time between two Indian space launches. P. Kunhikrishnan, director of the Indian launch base, said the PSLV has been fully assembled on its launch pad in advance of the mid-April liftoff. The IRNSS 1I navigation satellite set to ride the PSLV into orbit has also arrived at the launch base. The April 12 launch will be the first for India’s navigation satellite program since a failed PSLV flight in August 2017, which left a navigation payload stranded on the rocket. Preparations for the next launch of the GSLV Mk.3, India’s most powerful rocket, have also started at Sriharikota’s Solid Stage Assembly Building for a liftoff in the next couple of months with the GSAT 29 communications satellite. The high-power GSAT 11 broadband satellite, the largest spacecraft ever produced by India, is scheduled for launch in May aboard a European Ariane 5 rocket in French Guiana. And Chandrayaan 2, a robotic lunar rover, is expected to launch on another GSLV Mk.2 rocket in October or November, about six months later than Indian officials had previously announced. That will be India’s second moon mission, after a lunar orbiter launched in 2008. The high-thrust Vikas engine tested on Thursday’s mission, codenamed GSLV-F08, will be used again on the Chandrayaan 2 launch. “We are going to have highly-accurate, high-resolution satellites for remote sensing,” Sivan said of ISRO’s missions this year. “We are going to have a high-bandwidth satellite for communications purposes. This is going to make a revolution in India. “Along with that, the major mission this year is Chandrayaan,” Sivan said.